Bought one @ tesco Osterley, maybe national, because the price sticker actually shows £10. Noise cancelling technology has been developed into the audio processor which lets you enjoy direct sound clearly, without the interference of unwanted reflecting sound. Digital Audio Broadcasts have been with us since 1995 and are currently available in approximately 85% of UK households. However, plans are afoot to upgrade the current DAB service with a new and improved version. No date has been set for the introduction of this new digital radio service, but Panasonic have already begun to include a DAB+ tuner alongside the current DAB tuner in readiness for the switch-over. Music comes from many sources these days. It is easier now to move and share music to more than one player. And the MP3 compression system means that you can compile hundreds of songs in to your own favourite playlist. MP3 music tracks that are burnt to CD or copied to USB memory stick can be played back directly with this Panasonic player so that you no longer are tied to a pre-recorded music collection. 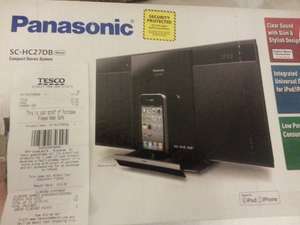 Panasonic pioneered the iPod Dock for music systems, and now stay one step ahead by introducing a direct digital connection. Most docking systems convert the digital audio playback to analogue which can result in loss of data and introduce unwanted noise. The Digital Dock on Panasonic systems however, maintain the digital signal to the amplifier resulting in a pure and accurate sound reproduction. Compact Stereo System. Featuring many unique acoustic technologies, HC produces clear vocals and dynamic bass sounds in spite of its slim compact body. It will exceed your expectations. The compact and slim body enables stylish layout even on limited spaces. Also,stylishly designed appearance will beautifully enhance your room interior. Digital music connection of an iPod or iPhone also allows the compact stereo system to process music signals in their original digital form. This eliminates sound degradation caused by digital/analogue conversion and during transmission. Allowing the users to enjoy their favourite iPod tunes with pure sound that is highly faithful to the original. Does that say wild goose chase in Chinese? Listening to this right now, the sound is very good actually, not the top of the range but definitely worth a tenner. last one I got, I think it's national cos the price sticker show £10. Upstairs, near the TV section. Do they have any left in osterley? I got the Pioneer one as well, but not for £10. The sound quality is really good. I'll give somebody a fiver if they spend the next week searching the UK to get me one of these for £10 Then I'll vote it hot. I'll give somebody a fiver if they spend the next week searching the UK … I'll give somebody a fiver if they spend the next week searching the UK to get me one of these for £10 Then I'll vote it hot. Are you paying the fiver in advance or is it a 'no win no fee' type arrangement? What's weird is that people vote these one-offs as hot! I'm not really sure why I'm here other than to check if there really is a Tesco at Osterley. Wasn't there in my day - 1963! These are not usually one offs so I don't understand why people rate these cold. I saw a similar post for the Sony dock and after a week or so found one in store after going to a few. you have to be at right place at right time and hope staff have not seen these before you. allmost all staff check here as well so before you get to the store the products are gone. you have to be at right place at right time and hope staff have not seen … you have to be at right place at right time and hope staff have not seen these before you.allmost all staff check here as well so before you get to the store the products are gone. So rather than all these deals what we need is one thread detailing which Tesco stores have staff with an IQ below the national average who, when putting up the yellow price like this one, don't immediately think "EBAY!" Thanks OP. I went to my local store and found and bought one. Easy. I could not find it in the Leicester store. There is only SC-HC28DB which is £130. So rather than all these deals what we need is one thread detailing which … So rather than all these deals what we need is one thread detailing which Tesco stores have staff with an IQ below the national average who, when putting up the yellow price like this one, don't immediately think "EBAY!" Correct, have you noticed most of the crepso postings say picked the last one. I am happy for the op and thanks for posting. This offer isn't at Tesco Extra DEREHAM... I didn't check but I don't need too, the prices on the "sale" items in their entertainment department are a joke. Once saw second hand xbox 360 games going for more than new of the same games a few shelves down. This offer isn't at Tesco Extra DEREHAM... I didn't check but I don't … This offer isn't at Tesco Extra DEREHAM... I didn't check but I don't need too, the prices on the "sale" items in their entertainment department are a joke. Once saw second hand xbox 360 games going for more than new of the same games a few shelves down. Were there anymore? Need something like this for my daughters birthday! Will this work as a free standing DAB radio?